In a city where so many architectural interventions quickly devolve into shooting matches, it’s nice to see an institution like the Frick Collection propose, discuss, listen, and reconsider. Okay, it didn’t quite happen that way. In 2014, the Frick floated a misbegotten expansion designed by Davis Brody Bond, and its aptly named director Ian Wardropper soon found himself diving for cover. Critics and preservationists, apoplectic that the plan involved the destruction of a tiny garden designed in 1977 by the landscape architect Russell Page, pressured the museum to back down. It did. Four years later, the Frick is tiptoeing back into the fray, and I hope it will take less fire this time. Back then, I suggested to Wardropper that he take the board on a field trip up Fifth Avenue to look at Annabelle Selldorf’s 2001 renovation of the Neue Galerie. What had struck me there was the finesse with which her firm modernized a nearly century-old Beaux-Arts mansion without resorting to the extremes of slavish reproduction or ostentatious contrast. It’s gratifying to see the Frick wind up where it should have been all along and hire Selldorf for the next iteration. 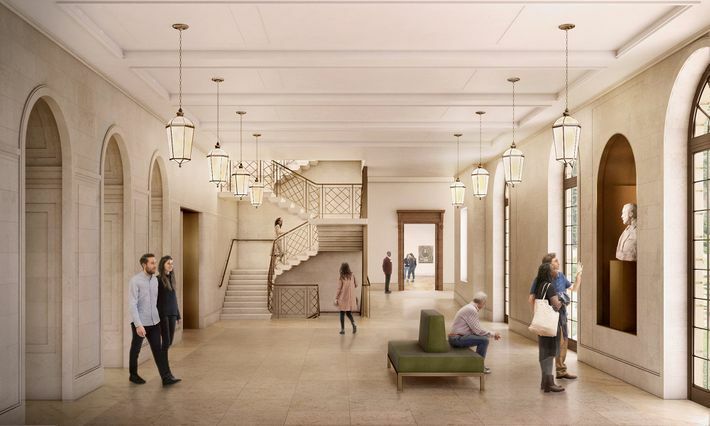 The new plan preserves — or rather rips out and then rebuilds — Page’s gated oblong of look-but-don’t-touch landscape, visible through the East 70th Street gate and the ticket hall’s French windows. That’s a fine thing. But even if the garden had been an asphalt basketball court, the last go-around —the fourth attempt to renovate since the new century began — had other problems that Selldorf’s design avoids. 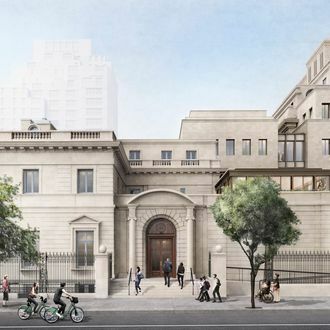 Davis Brody Bond wanted to add an ungainly new wing onto the seven-story library building on East 71st Street, driving it right through the block. The slab’s narrow end would have faced East 70th Street, looking like the mansion’s large adult son — taller, with similar features, but not as sharp. Selldorf’s interventions, on the other hand, take place well away from the street. Instead of packing public and back-of-house functions into a single mass and pushing it up against the property’s perimeter, she finds space within, below, and above. Two new floors will rise above the existing auditorium. The library building will stretch too, but only slightly, into what is now an air shaft full of out-of-date mechanical systems. And a three-story stack of passageways connects those two new structures. Selldorf’s scheme also carves out fresh exhibition space from poorly configured interiors and burrows underground for a new auditorium. The core of the Frick experience is its domestic scale, the sense of vicarious privilege that comes with strolling around a family home bedecked with Holbeins and Titians. The goal has always been to expand on that experience, not overwhelm it. For now, visitors see the opulent second floor only remotely; the museum hopes to invite them upstairs. Sitting at a conference table on that level with Selldorf and Wardropper, my eye drifting out to Fifth Avenue and the still-struggling greenery of Central Park beyond, I thought that this walnut-paneled room is far better suited to art than to PowerPoint presentations. The hallway, where painted birds disport themselves on the vaulted ceiling against a summer sky, shouldn’t be merely an employees’ preserve. Opening the second floor to the public means moving offices out of the way, and makes many unglamorous demands on its scarce square-footage: conservation facilities, freight elevators, wheelchair ramps, a library digitization lab, a climate control system, and so on. Selldorf satisfies these needs, but her focus remains squarely on the visitor’s experience. That means leaving the most glorious rooms just as they are while performing surgery on awkward interiors and opening up dead ends. For now, most people enter the foyer from 70th Street, turn right, squeeze past the coat-check line and around a stairway that winds down to the basement restrooms, and then file into a narrow ticket hall. On the way out, they can either shove their way back the way they came or jostle into the cramped bookstore. When a popular exhibition is up, the sequence can feel like getting on an F train at rush hour. For the wheelchair-bound, it’s even tougher. Selldorf would excise the staircase, move the coatroom downstairs, and promote the bookstore upstairs, to a new level found by dropping the ticket hall’s ceiling and raising its roof. Renovating an old building means, above all, unearthing unsuspected space that’s been there all along. The Frick has grown over the years, from the 1914 mansion by Thomas Hastings through the 1935 renovation by John Russell Pope to the 1977 reception hall and Russell Page’s garden. In 2011, Davis Brody Bond enclosed the original portico. These mutations all spring from its Gilded Age DNA, with a seamlessness that helps give each visit its magic. When the museum first opened in the middle of the Depression, critics admired how skillfully Pope had transformed a collector’s plush retreat into a public institution. The lush, glass-roofed garden court and the oval gallery, with its wooden columns and elaborate parquet, were magnificently anachronistic creations in the era of sleek spired skyscrapers and Central Park Hoovervilles. All these years later, the Frick could have stayed faithful to Pope’s Beaux-Arts approach. After all, we still have architects fluent in the language of neo-classicism, who can imitate imitations of antique models with fidelity and even flair. At the other extreme, the museum might have opted for the Renzo Piano solution: dramatize the gulf between old and new, usually with glass. At the Isabella Stewart Gardner Museum in Boston, Piano added a modern satellite and linked it to the neo-Venetian mansion by a glassed-in walkway. At the Morgan Library and Museum, he joined the original buildings with a glassed-over piazza enclosed in a white steel cube. Instead, the Frick has wisely opted for a third way: modernism with a human face. Selldorf does not do Ye Olde Ionic orders or ironic dentil moldings. Her strength lies in understanding — feeling — the grace and proportions that characterizes the best of Beaux Arts architecture and finding contemporary ways to express them. The ideal intervention would satisfy paradoxical demands: to be spectacular and go unnoticed, to fuse with the historical fabric without imitating its style, and to make the interior as spacious as possible without inflating the structure. Selldorf has gotten most of the way there. Her future Frick skirts the garden, respects the skyline, and emerges organically from the architecture like new growth on an old tree. A few tradeoffs and compromises haven’t yet come clear. The link between the two new structures still has a perfunctory look. The major loss is Pope’s circular music room, with its skylight, narrow vestibules, and classical arch pediments. Too small and acoustically iffy for the public events and concerts it is supposed to serve, it will transform into a square suite of temporary exhibition galleries. As the design gets refined, the Frick must give today’s architectural craftsmanship the same respect it accords to, say, 18th-century silver. That means easing up on the brutal process known as value engineering, when details are winnowed out to keep the budget lean. Selldorf, too, will need to show that her light touch extends to lighting, railings, elevator doors, and so on — the kind of details that don’t show up at this stage but that make the difference between corporate décor and a place full of magic and personality. The Landmarks and Preservation Commission still has to sign off on the plan. I hope they give clear instructions to both architect and client: You’ve found the right direction. Now don’t screw it up.